Nick began writing “A Little Bit Longer,” his song about tribulations of any sort, at age 13, on the day he was diagnosed with type 1 diabetes. He’s been singing since he was only three years old, when he used to stand on the furniture and sing into a turkey baster microphone. A serious, well-behaved child who was homeschooled and rarely reprimanded, he entertained himself with music rather than toys: He’d put on musical shows for his family and charge $5 for tickets, a far cry from his sold-out shows today. With both music and diabetes, Nick has come a long way since his diagnosis in November 2005. In 2007, the Jonas Brothers performed at a Diabetes Research Institute fundraiser in New York City. During the show, Nick asked his audience to raise their hands if they had diabetes. Then he raised his hand too, revealing to his fans for the first time that he had diabetes as well. 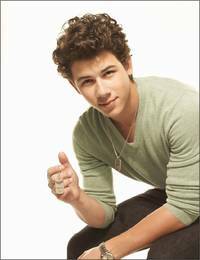 Since that time, Nick’s become a shining light for type 1 diabetes, a charismatic advocate and fundraiser, and a real star with whom youngsters with diabetes can identify and from whom they can take comfort. Since August 2008, Nick has been a diabetes ambassador with Bayer Diabetes Care, to help young people manage their diabetes and support them in giving back to their community (NicksSimpleWins.com). In June 2009, he met President Obama (and both the Obama daughters) when he went to Washington DC to testify before the Senate Homeland Security and Government Affairs Committee, along with Sugar Ray Leonard and Mary Tyler Moore. That’s something for us all to look forward to.